Last weekend we hosted a big family meal at our house to celebrate my father’s 61st birthday. 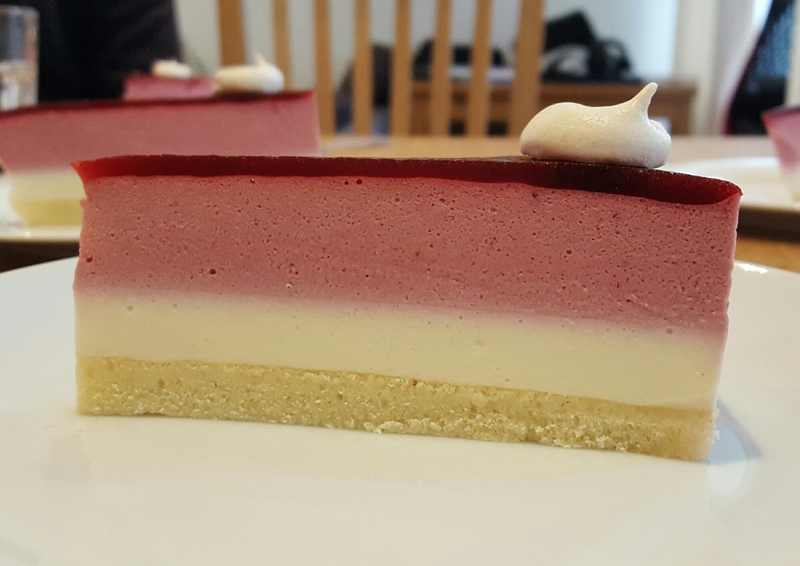 It was the perfect opportunity to trial a new recipe I’ve been working on – a blackberry and elderflower entremet. I was initially quite cautious with the elderflower cordial but the cream really does need a fair bit to stand up against the strong flavour of the blackberry. I ended up using roughly 150ml (instead of 80ml) and think it could have used a little more. I’ve amended the receipe below to reflect this. During the defrosting phase my blackberry mousse bled trails of purple down the outside of the entremet. It was a little strange as the mousse was very well set and the layers in the middle remained perfectly even. I think this could be a combination of taking the cake ring off too early and also letting it defrost for half the time in the kitchen rather than the whole time in the fridge (I was short on time). Something to consider for next time! Preheat the oven to 190°C and line a 30 x 40cm flat baking tray with a non-stick baking paper. Carefully fold the sifted flour into the sabayon using a spatula. When it is around three quarters folded through take 2 large scoops of the sabayon and mix it into the melted butter. Then add the butter mix into the sabayon and fold through until fully incorporated. Pour the mix onto a lined baking tray, spreading evenly with a palette knife and bake in a pre-heated oven for 12-15 mins. You’ll know when it’s done as the sponge will be golden brown and spring back when pressed gently. Leave to cool and then use immediately or freeze for up to a month. Put water, caster sugar, lemon peel, seeds from the vanilla pod and the pod into a saucepan and bring to the boil. Cook for 2-3 mins, take off the heat and leave to cool. This should make 200ml of simple syrup which will be used within the blackberry glaze and to moisten the sponge. Soak the gelatine in a bowl of water for 3-4 mins until softened. Squeeze out excess water and put aside. Whisk the egg yolk and sugar, beat together for 4-5 mins until fully incorporated and has turned light yellow. Bring milk to the boil then add gradually bit by bit the milk to the egg/sugar mix. Put mix back in saucepan and heat until it thickens stirring constantly with a spatula. Add the elderflower cordial and gelatine. Remove pan from heat and place in a sink of ice and whisk for 2-3 mins (this will help if your custard starts to split). Refrigerate. Whisk the cream until just past the ribbon stage and fold into the egg mix. Use immediately. Blitz blackberries in a processer. Bring water and sugar to the boil and remove from heat to cool. Poor the warm syrup and lemon juice onto blackberry mix and then pass through a fine sieve. Leave to cool. The puree will be divided and used for the mousse and glaze. Soak gelatine. Whisk cream until ribbon stage. Put 150g of puree in saucepan and add sugar heating gently until sugar dissolves. Add gelatine and stir till dissolved. Strain and add remaining puree. Fold in cream and use immediately. Soak gelatine in a bowl of cold water. Put the vanilla pod and scraped out seeds into the pan with the blackberry puree and simple syrup and bring to boil. Squeeze out the excess water from the gelatine and whisk the gelatine into the mix. Pour the mix through a fine sieve and store in an airtight container until ready to use. This can be stored in the fridge for up to 2 weeks. Cut the génoise sponge into a 10″ round using a cake ring as a guide. Brush the sponge with some simple syrup. Cover the cake with Clingfilm and leave in the fridge for 1 hour to set. You can start making the mousse whilst you wait for the cream to set. Remove the cake from the fridge and pour the blackberry mousse on top, using a palette knife to spread the mix evenly. Take the entremet out of the freezer and gently brush off any ice that may have formed on top of the mousse and the cake ring. Pour the blackberry glaze over the frozen mousse and leave in the fridge to set for at least 20 mins. The glaze will need to be at room temperature before use so if you’ve made this in advance and stored in the fridge you’ll need to melt it down again in a saucepan on low heat and leave to cool on the side until it’s reached room temp.